Air con not working, thoughts? Re: Air con not working, thoughts? Glad you got air con sorted. Sorry to hear you lost one of your beloved friends last week. Lost our Springer 5 weeks ago. @Jocko: Not a problem, won’t be the first time they’ve had a chuckle at my expense. @Bristolroversfc: Many thanks. Was not unexpected but still heartbreaking. He was 12 1/2 and getting slower & slower, finally running out of steam. He’s now in the back garden so we still speak to him. Gratuitous pic of Sam (left and no longer with us) with his bruv Toby, taken a few days before the end. Great news! And Honda wanted how much??? The moral of the story is if it's too expensive, always get a 2nd opinion. My i-Shift actuator went couple of months ago and Honda wanted £2k! Luckily with the help of this Forum, a specialist did it for £320! Right, confession time. Went to switch off the AC this morning, reached for the on/off button and SWMBO chirps out “it’s already off!”. Hmmmmm, thinks I, wonder if that was the problem all along. When selecting aircon, the first bit is for it to be off, then you have to select it again to get the aircon on. Not sure that is sensible for my logic! Lovely dogs you have (and had). Can I ask if you used a ramp or anything to help them get in your Disco, or were they all able to make the jump? 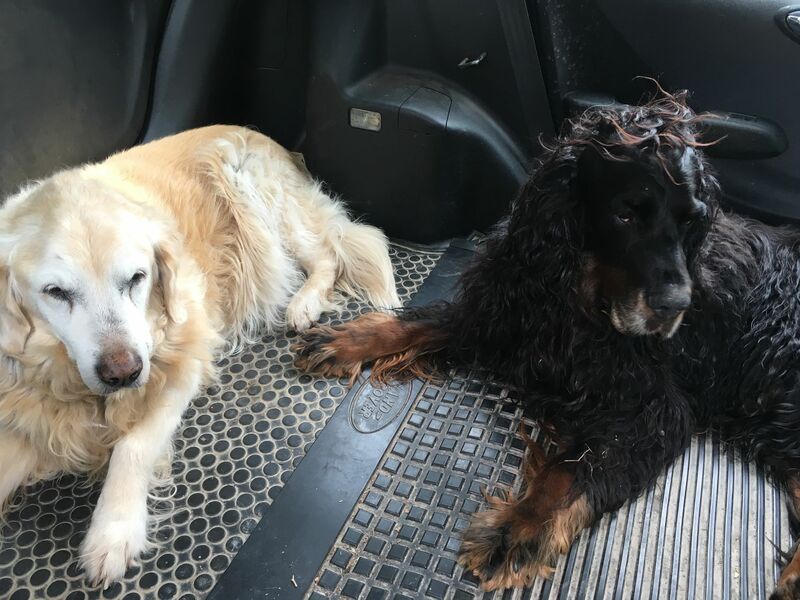 I have a couple of elderly dogs I can't easily lift anymore and they struggle sometimes to jump into my Rav4. We never needed a ramp for Sam, the now gone one, he would just step up to get his front legs up into the Jazz then we’d lift his back end in. He was a heavy one (38kgs) so we had to be careful lifting him. Toby just chucks himself in, we now have to make sure we give his back end a little help as he clatters his back legs off the seat base if we don’t. It’s one of the reasons we’ve had 4 jazzes (still running 2 of them), they are ideal dog-mobiles. 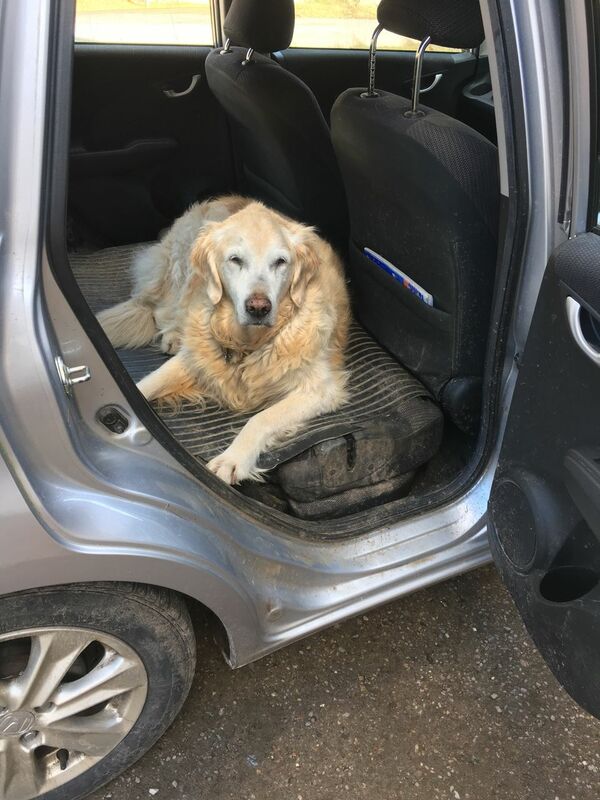 In the last few weeks Sam loved just staying in the car for a few hours after his walks, often parked up in the back garden with the doors open. Great for watching the world going past and the birds flying around. On our GE it just has AC = ON (or OFF) in the round display, for us the green light in the separate switch is that air is coming in from outside as opposed to recirculating. And that was way too easy. MrsDSL did a long drive today and reports that it deffo doesn’t work. It’s back to plan A, or is it B, will get her (the car not SWMBO) regassed. One point to bear in mind is that if the air circulation fan is turned off the aircon goes off as well. It assumes that if you don't want any air you don't want any aircon. My 09 Jazz never gets any cooler with the green light on. Turning it on and off does affect the tacho so I think the clutch, relay etc are working. However, I have strong evidence that the car wasn't used for at least 6 months before I got it. My aircon works with it in either recirc or exterior, just like every other car I've owned. My Volvo S40 only worked on fresh air.